Jay Cutler had the stitches removed from his thumb Wednesday but is still unsure when or if he will be back for the end of the regular season. Jay Cutler had the stitches removed from his thumb Wednesday and told ESPN 1000's Waddle & Silvy show that "everything is on track." 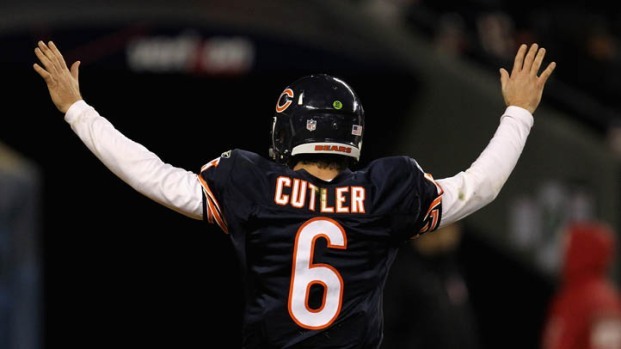 Cutler said during the surgery he gripped a sterilized football to ensure the screws and pins were properly placed. Dr. Randy Viola did this so Cutler would have some freedom and flexibility in his thumb. "It's just a matter of letting that bone heal and maybe taking the pins out," Cutler told the two hosts. "Time's not really on our side right now, but that's all we can really do." Cutler had surgery on his thumb a few weeks ago and the doctor inserted three screws and two pins to hold his thumb together. The pins will be taken out, but the screws will stay in. What kind of recovery time is Jay Cutler facing? A Rush University Medical Center surgeon breaks it down. Cutler said in the show, he was working on his flexibility and mobility and hopes to begin throwing in the next couple of weeks and that some of the pain will subside. Even with the surgery, Cutler is unsure when or if he will be back for the end of the regular season.